Cover is in good condition latches and rubber strap are good. POWERHEAD 277173. 1963 Evinrude 3 hp Lightwin 3303S. will be attached. Up for grabs, I have a powerhead removed from a 1969 115 HP Evinrude outboard. It could maybe use a hone and maybe rings. I think It would be fine otherwise. Up for grabs, I have a powerhead removed from a 1982 60 HP Johnson outboard. Its a nice powerhead ready to bolt on and run. I believe this will replace 40 and 50 HP omc motors too from roughly 1979-1987. All the cylinders have been bored to a maximum of. 030, the pistons, rings, wristpins, and all bearings have been replaced, and the powerhead has been repainted. The part is in good used condition. The cylinders are good. Removed from a fresh water engine. Part #: 5004178. Fits 150hp CX & PX models from about 2001-2006. Fits: Johnson 150hp CX & PX from about 2001-2006. Check pictures carefully to see if it fits your needs. This is a nice powerhead overall and is an easier fix instead of rebuilding your current blown powerhead. I'm just not sure which years exactly. Up for consideration, I have a cylinder block / crank case removed from a mid 1980s 40 HP 3 cylinder yamaha outboard. The cylinders are scored so will need to be bored/honed/repaired. I believe the motor was a 1985. Deck block surface if necessary. resurface cylinder head. we will mount/strap powerhead to pallet for pick up. 200 HP EFI Models from 2000 to 2001. 200 HP EFI Models from 2002 to 2008. 200 HP Carbureted Models from 2000 to 2005. 200 HP Models from 2005 to 2008. 225/250 HP Models from 2005 to 2008. 200 HP Models from 2010 to 2012. Part #: 5006290. Fits 25hp & 30hp SE models (2009). Fits: Evinrude ETEC 25hp & 30hp. 150 HP XR6 Models from 2000-2005. All the cylinders have been bored to a maximum of. 030, the pistons, rings, wristpins, and all bearings have been replaced, and the powerhead has been repainted. 150 HP EFI Models from 2000-2001. 200 HP EFI Models from 2002 to 2008 All the cylinders have been bored to a maximum of. 030, the pistons, rings, wristpins, and all bearings have been replaced, and the powerhead has been repainted. 200 HP EFI Models from 2000 to 2001. Part #: 5000822. Fits Ficht 135, 150, 175hp 2002-2006. 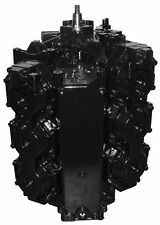 Fits: Evinrude V6 135, 150 & 175hp 2002-2006. Check pictures carefully to see if it fits your needs. The head has not been removed or opened up since new, so I don't think it has ever run. All the cylinders have been bored to a maximum of. 030, the pistons, rings, wristpins, and all bearings have been replaced, and the powerhead has been repainted. 2001 135 HP. 1992-1994 120 HP. 1992-1997 125 HP. All the cylinders have been bored to a maximum of. 030, the pistons, rings, wristpins, and all bearings have been replaced, and the powerhead has been repainted. A Gasket Kit is included in the order, as is a Limited One-Year Warranty. Up for consideration, I have a crankshaft and pistons removed from a 2004 50 HP Yamaha 2 stroke outboard. I decided to part this out due to poor compression on 2 cylinders. There's a small broken piece of one piston (see pics) otherwise they are all usable. Part numbers are shown in pictures. They were removed from a alate 1980s, to early 1990s motor. Up for grabs, I have a powerhead removed from a 1989 50 HP Johnson outboard. It is missingthe cap for the thermostat, and thermostat (see pictures). This should bolt onto 1989-1992 40-50 HP OMC motors. Part #: 5005507. Fits: Evinrude ETEC 40hp, 50hp, 60hp. Fits 40hp 50hp 60hp SO & SR models (2004-2005). All the cylinders have been bored to a maximum of. 030, the pistons, rings, wristpins, and all bearings have been replaced, and the powerhead has been repainted. 70/80/90 HP Models from 1987. This item should fit various 2004 and later F225. This is a remanufactured cylinder head. This item is remanufactured. Manufacturer: Yamaha. Head has been dis-assembled, thoroughly cleaned. Mercury 25 HP Powerhead 1986 Good Compression . Condition is Used. Its a little dirty but runs great !! 115/130 HP Models from 2007. Fits Serial# Range 6073191 and below. Transom Drain Plugs. Light weight and strong! Perfect for the interior or exterior on boats and RV. Easy to install in minutes. White Grab Handle. The motor had great compression but no spark. The S/N of the motor it was removed from is pictured. I stand by my products! SINCE 1972 , WHY WOULD YOU BUY A USED OUTBOARD ? Fits 25hp 4 Stroke. Block has crank & pistons all installed. Includes gaskets shown. Cylinder head not included. See pictures for details. This rebuild kit is designed for use with Johnson/Evinrude 150-175 HP 60-Degree Carbureted 6-Cylinder Powerheads. The kit includes the following One Gasket Kit [including 6 Head O-Rings, 1 Base Gasket, 1 Port Intake Gasket, 1 Starboard Intake Gasket, 1 Portside Intake Gasket, 1 Starboard Intake Gasket, 2 Lower End Cap O-Rings, 1 Regulator Gasket, 2 Thermo Seals, 1 Lower Crank Seal, and 1 Upper Crank Seal]. Part #64816A73 super cedes to: 4816A73, 64816A74, 64816A75, 64816A76, 64816A77, 64816A78. Fits 115hp. Having the right type of powerhead on your outboard motor can make a difference in how you get around, whether you do marine or freshwater boating. It's the workhorse in your engine, so you need to be sure that it's functioning efficiently. 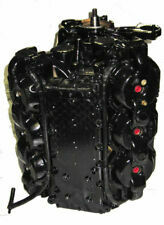 An outboard powerhead can have different features, parts, and needs. What is an outboard motor powerhead? What are some manufacturers of powerheads? What are features of powerheads? Cylinder: You could go with either a two-, three-, four-, or six-cylinder powerhead. Your options could range from the Evinrude ETEC two-cylinder to a Mercury/Mariner 2.0L 135-150HP six-cylinder unit. The more cylinders, the greater power you will have, as each additional cylinder lets you burn more fuel and get more displacement during each revolution of the engine. Stroke: Depending on your boat's outboard engine, you'll need a unit that is compatible with either a two-stroke or four-stroke system. The names of the systems indicate whether one crankshaft revolution translates into two strokes (up and down) or four strokes. The four-stroke systems may be larger, but they've traditionally been more fuel-efficient. Horsepower: The greater the horsepower on an outboard motor, the more propulsion and speed you'll be able to achieve. However, more doesn't necessarily equate to better. If you have an engine that's too powerful or heavy, it could tip the bow of your boat too high. The capacity plate on the stern of your boat will let you know what range of horsepower is allowed for your craft. Is it easy to remove an old powerhead? 1. Press the latch on the top cover to remove it. 2. Unscrew the mounting screws to remove the cowling. 3. Remove the flywheel using a wrench and flywheel puller. Pull out the ignition coil. 4.Unscrew the bolts that connect the powerhead to the lower unit. 5. If it gets stuck, you can use a flathead screwdriver to pry it up and a rubber mallet to gently break the gasket seal. Do the steps in reverse order when you've decided on which new piece to put in.